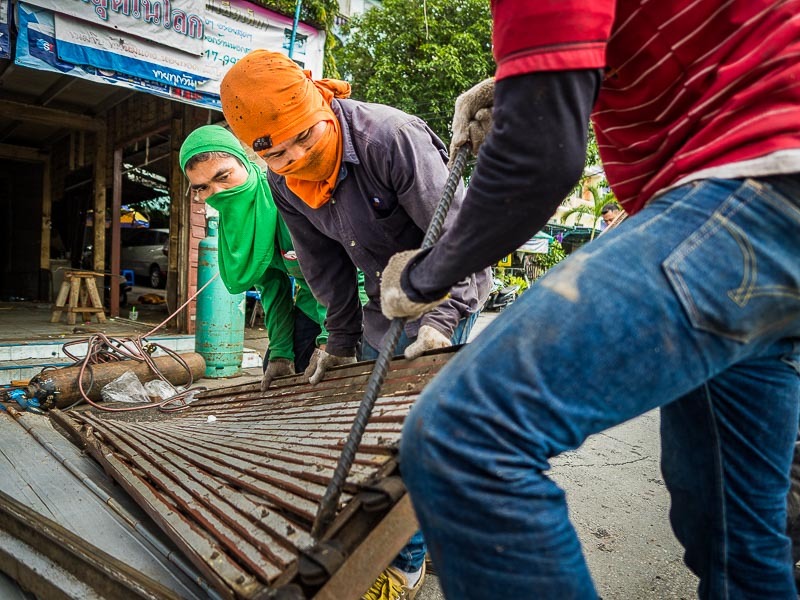 Workers take apart the gate to a home near Wat Kanlaya in Thonburi. 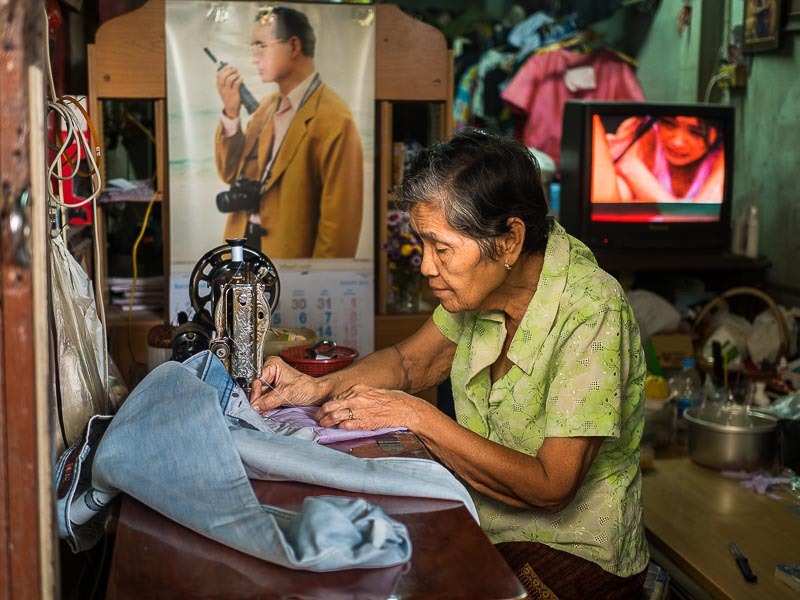 Bangkok is a city that is constantly being reinvented. It was founded in the late 1700s as the center of the Siamese Kingdom after the Burmese sacking of Ayutthaya, so it's a not very old city. And like comparatively young cities in the U.S., there isn't much appreciation for old here. Entire city blocks are ripped up and rebuilt all the time. Frequently the changes hurt the people who can least afford to be hurt. Wat Kanlaya is a historic Buddhist temple on the Thonburi side of the river. It was established in the 1820s, so even by Bangkok standards it's not very old. But the temple has royal status, sits next to the Santa Cruz neighborhood and is across the river from the Flower Market and close to Chinatown so it's a high profile temple. Like many of the temples, especially along the river, a community has grown up around the temple. People, many of them quite poor, live in shacks on land they've rented from the temple. A woman in the Wat Kanlaya community does seamstress work in her home. About 10 years ago a new abbot took over at the temple. He started making improvements at the temple and local people expressed concern that the changes didn't keep with the historic nature of the temple. The abbot decided to redevelop some of the land around the temple, including the land people had been living on for generations and tried to evict the people who lived on the temple's land. The case worked its way through the legal system and the courts sided with the temple. The evictions started this week when demolition crews started tearing down homes in the community. 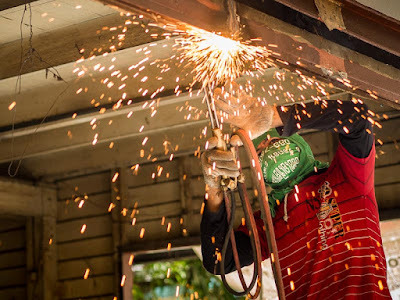 A worker uses a cutting torch to take out a metal gate in a home in the community. This is a complicated situation. The people have lived in their homes for generations. Many have nowhere else to go. But the temple's ownership of the land is not in dispute. It's well documented and even the residents don't dispute it. A resident of the Wat Kanlaya neighborhood talks to a policeman as the demolition starts. These old neighborhoods have a certain charm. The people who live in them are working class - the "salt of the earth" who provide the muscle that moves Bangkok. 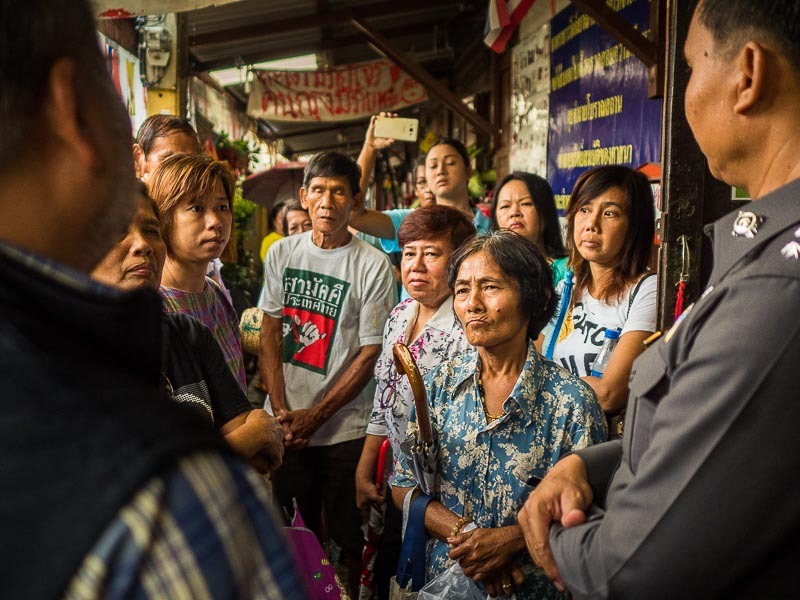 Historically, it's been the cheapest land in Bangkok in the most congested part of the city. Now many of these riverside communities are being ripped up to make way for new urban developments along the water. 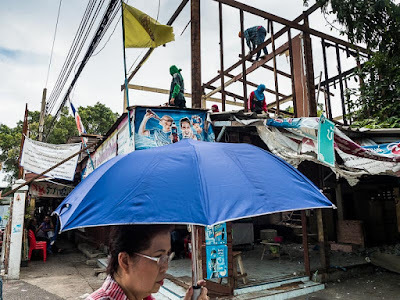 A woman walks past the first home in Wat Kanlaya neighborhood to be ripped down. I don't know what the solution is, but it seems that the die is cast and the poor people who live along the river are there on borrowed time. This is a topic I hope to revisit and work on over the next couple of months. 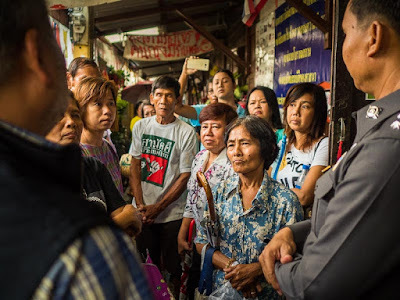 People talk to police in the Wat Kanlaya neighborhood just as the demolition starts.